Do you have too much time on your hands? Are you sometimes left wondering what you could possibly do with all your spare time? 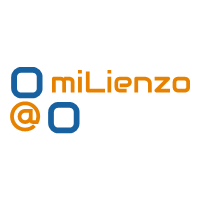 Do you just wish that there was another instant-messaging-social-media know-what-you’re-doing-at-all-times thingy to play around with? Well, I guessed not. 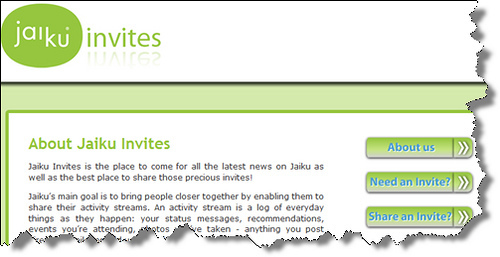 But if you are interested I happen to have a few Jaiku invites available. Jaiku is a Twitterish microblogging tool/platform developed by some Finish folk and made the news last year when it was acquired by Google. I joined Jaiku a couple of months ago and to be honest, I’m not sure I’ve fully taken to it yet. But microblogging is all the craze and it’s what the cool kids do. Apparently. And besides, as Jaiku is still open to invite only whilst Google do whatever they are doing to the platform, I suspect these invites might be in high demand? So if you fancy an invite drop me a line below. First come, first served!